We cover the full spectrum of painting & decorating needs both exterior painting to internal painting and decorating, including rubbing down, scraping off old flaking paint (or burning off stubborn unsightly paint if required). One of most important aspect of outside decorating is the thickness of each coat of new paint and the time left between each coat application – the rule of thumb is normally one coat of primer (if new or exposed wood), two under coats and one top coat. However, in some circumstances it can more appropriate to have one primer, one undercoat and two top coats, with no more than 24 hours between the two top coats being applied. The biggest determinant of which method of application to use, as you can imagine is the weather. As it is important to let the timber breathe applying more coats than described are not recommended and this can quite often lead to blistering. Drying time of paint is important and if necessary this can be accelerated by the use of dryers, which are very small amounts of chemicals added to the paint that speedsup the drying time (sometimes x 2), and this cana be useful in cold weather, or where you need to apply two coats in one day. 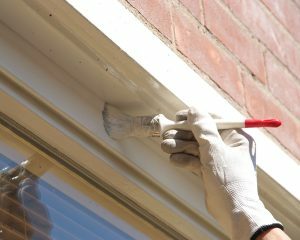 The exterior painting and decorating of a property is a much neglected side of property maintenance, however with the advent of UPVC windows and doors it does make it easier for property owners to keep on top of the exterior painting and decorating especially if the original paintwork is intact. Years ago internal painting and decorating was mostly concerned with which wallpaper to use on ceiling and walls, and wallpaper hanging was a large part of our decorating work. This however, has changed dramatically in recent years with householders and (especially landlords) taking advantage of better finished walls in properties, and the incredible array of different colored emulsions that have become available. There are literally 100’s of different colures to choose from and this has led to the demise of wall paper in a lot of modern properties, although we are starting to see this trend go full circle, with a modern range of choices for wallpaper hanging again becoming popular. The 1970’s and 80’s saw the advent of plastered artexing of ceilings and walls, but these are no longer popular as they can look dated, and we now undertake quite a range of jobs where we remove the textured look and return walls and celings back to flat plaster. As far as paintwork goes, and to get a finish that is immaculate, it takes a lot of preparation, and dare I say it, lots and lots of rubbing down and preparation work. Traditionally, and for many years, gloss was the king of internal painting finishes, but it is now more common to find eggshell and satinwood as a preferred wood finish, or indeed stripping back to wood for a more natural look. Irrespective of what the internal painting and decorating fashion or taste,you’re your exterior painting and decorating requirements (small or large), we can meet all your painting and decorating needs. At A C Joinery we cover a large area with our painting and decorating services, including areas such as Didsbury, Cheadle, Bramhall, Stockport, Hale, Altrincham, Sale and South Manchester. "Andy is a first-class craftsman and professional builder. He has a broad range of skills including building work, joinery, electrical, plumbing, flooring etc. and is happy to deal with large and small projects. I would not hesitate to recommend him to any of my friends and/or fellow landlords.........John (Sale)."